Hay is for Horses. Straw is for Houses. 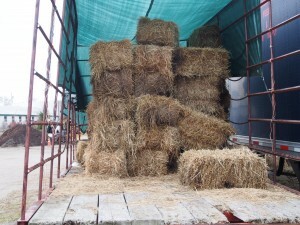 Hay, such as timothy mix or alfalfa, is used as an animal feed. Most of the time, seeds are still intact in the hay bale. Straw is a stalk, typically a by-product of wheat. Straw can be used as bedding for barnyard animals, mulch in gardens, and other non-consumption uses. Choose from our huge selection of quality grasses and hays, including Timothy Hay and alfalfa, to help provide long-strand fiber, encourage proper nutrition, and help keep your animals teeth healthy. Single ingredient Timothy Hay has no fillers – it’s all pure hay cut at the peak of summer, so your animal gets softer stems and sweeter taste. Perfect for selective eaters! We have a steady supply of great hay available readily available for your farming and house needs. We source and haul our hay all the way up from Canada and Upstate New York- guaranteeing you get the finest quality product. 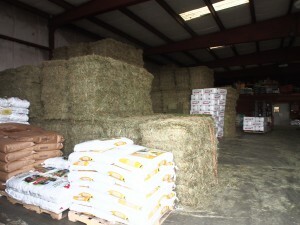 Our hay & straw is stored in a dry barn located on site. No dust, no rain, no problem! Ferestien Feed and Supply shavings provides the highest quality pine wood, dust free shavings for horse stall bedding available. Fluffy, dry, minimal dust, and eco-friendly, these bagged wood shavings are great for use in barns, stables, stalls, trailers, pens, and cages. They are used as bedding for horses and show animals. Also can be used for small caged animals as well. 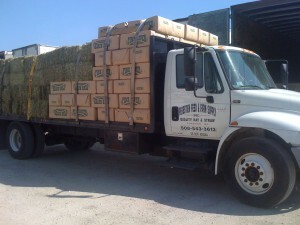 We deliver your Boston area feed and farm supplies! Ferestien Feeds fleet of delivery trucks are located in Foxboro MA. Delivery is scheduled through Ferestien Feed and Farm Supply. Please Call 1-508-543-3613 to schedule your delivery..